Democrats narrowly evaded a virtual shut out in Tuesday’s California “Jungle Primary,” or “Top-Two” election, and finished second to Republicans. In fact, in two Republican held districts that went for Hillary Clinton in the 2016 election, the Democrats expected to easily take down the currently Republican held seats. However, with a combination of a very crowded Democrat field of candidates, and a growing sense of discontented voters, the Democrats ‘blue wave’ faded into oblivion. The districts in question include the 39th, 48th, and 49th districts, which cost the Democrat National and State Party vast millions of dollars. Had they been completely shut out, the Democrat Party would have been shut out of the General Election in November. It was a nightmare scenario, and would have made shut the Democrats out of the ability to take control of Congress next year. Consequently, Democrats today are somewhat relieved that they didn’t get shut out of an un-loosable seat. However, the elections should have been an easy win for the Democrats in California, and it turned out to be quite the contrary. In fact, Democrats were nearly shut out of other competitive districts where there had not been any real threat from the Republicans. Districts like California’s 10th and 50th. Even more concerning for the Democrats was that the Democrats were completely shut out of California’s 8th District. A district where Paul Cook (R-CA) will face Tim Donnelly (R-CA), who is a strong Conservative and is a conservative radio host and Breitbart News Contributor. 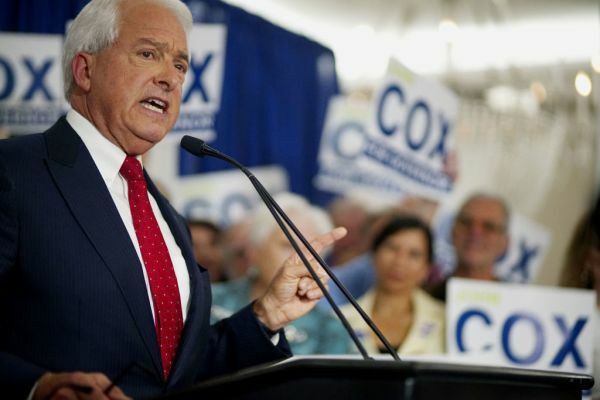 As for the Governor of California’s seat, businessman John Cox took a commanding second place finish, just behind Democrat Lt. Governor Gavin Newsom. Newsom has been an open opponent of President Trump who has favored imposing exorbant taxes on the people of California, fought to protect the violent MS-13 illegal alien gangs, fought President Trump’s tax cuts, and vowed to protect the state’s ‘sanctuary state law. Conversely, the Republican GOP gubernatorial candidate John Cox is in favor of lowering taxes, securing the border, deporting the violent MS-13 illegal alien gang members, and overturning the states sanctuary city law. In fact, despite his not voting for Donald Trump during the 2016 election, he was able to get the Presidents endorsement, which is what propelled him to close the gap with Newsom in the final days leading up to the June Primary. Alabama, Iowa, Mississippi, Montana, New Jersey, New Mexico and South Dakota. In Montana, Conservative State Auditor Matt Rosendale won the Republican nomination for Senate over his liberal counterparts. In November, he will face incumbent Democrat John Tester, who was caught making up lies against President Trump’s VA Secretary Admiral Ronny Jackson. In 2016, President Trump won the state with a commanding margin, and Tester has been waning in popularity over his attacks against Admiral Ronny Jackson, and President Trump. In Alabama, Republican Rep. Martha Roby will face a July runoff to save her seat after failing to top 50% in Tuesday’s primary. She is favored to win in the runoff, but she will go against Bobby Bright — a former Democratic congressman who is now running as a Republican. Representative Kristi Noem won the Republican primary for governor against Attorney General Marty Jackley. If Noem wins in November, she’d be the state’s first female governor. In Iowa, Democrat Fred Hubbell won the primary to face off against Deb Haaland won the primary to face Republican Gov. Kim Reynolds. Also, in the California Primary, voters chose to recall Democrat Josh Newman over his vote for increased gas taxes. He lost by 19% (59.5% to 40.5%) A gas tax that has been pushed by the current Socialist Governor Jerry Brown (D-CA). It was a 12 cent per gallon tax hike. They chose Republican Ling Ling Chang to replace him, which ultimately prevented Democrats from having a supermajority in the upper house. Also, Democrats have been plagued with sexual scandals that have led to a slew of California Democrat resignations. United States Senator Bob Menendez (D-NJ) has been mired in corruption charges. Charges that are indefensible, and they have been highly publicized throughout New Jersey. . The Senate Ethics Committee admonished Menendez in April for serious corruption allegations. With his election victory by Democrats, it leaves him extremely weakened and vulnerable to an election loss to the Republicans. Menendez would have likely lost to his Democrat rival, but there wasn’t enough time to meet the campaign funds reporting requirements. Consequently, it will set up Republican Bob Hugin, a former pharmaceutical executive, to face him in November. Hugin is expected to run a well-funded campaign. Worst case scenario, this puts New Jersey in play for the Republicans, and draws millions of dollars away from other races. Even worse for the Democrats, if they lose the seat, there is no possibility for the Party to win control of the Senate. Second, Republican John Cox is running in November against Democrat Lt. Governor, and former San Francisco mayor, Gavin Newsom. Due to expected Republican turnout, the governor’s race is now expected to be competitive. Also, with Cox on the ballot, it will likely be a larger draw for Republican turnout. Consequently, it could make the difference in the Republicans winning a number of House seats. Combine that with unpopular policies in California like protection of MS-13 gangs, enormous gasoline tax hikes, sanctuary city policies, and more, it could spell substantial problems for Democrats this fall, leaving them more vulnerable than they have been in more than 20 years. Then, there is Minnesota. Surprisingly, the Democrats not only pushed their Party even more left, but they went full Communist! Democrats snubbed Attorney General Swanson, and in return, she decided to run for governor. A move that many analysts like Barry Casselman claim will result in former Republican Governor Tim Pawlenty to win the election and take back his former title. AG Swanson’s last-minute move also opened up the Attorney General position, which resulted in Keith Ellison becoming the Democrat AG nominee. A move that will not likely be well received by the overall Minnesota voter. In addition, with Republican Tim Pawlenty running as governor, it will likely create a vacuum that makes it easier for the Republican’s to win House seats, making Pelosi’s opportunity for taking the reigns of the House less likely. Also, with the chaos erupting throughout the Minnesota Democrat Party, and as the Party becomes more radically left, United States Senator Tina Smith, who replaced disgraced Al Franken could very well be at risk. Regardless of the outcome, one thing is certain. The Democrats will have to spend a small fortune to try to win seats in Minnesota, just like California. Consequently, it will drain resources that they desperately need to fight for other vulnerable seats like Missouri Senator Claire McCaskill’s seat, as well as others throughout the nation that would otherwise be safe. In all, America is back in business. Last weeks job numbers showed that America’s businesses and manufacturing sectors are booming, and life for the average American is improving. With the Federal Reserve’s new estimates for America’s economic growth zooming past 4%, President Trump’s economy is reminiscent of former President Ronald Reagan’s economic growth, and more than double former President Obama’s numbers. American’s now feel that their lives are better off today, than they were just a few years ago. As a result, a phenomenon is beginning to emerge that is creating the perfect storm for Republicans this fall. A phenomenon that is putting Republicans on top in polling numbers. A trend that has shifted from the blue wave, to purple, and now light red. Furthermore, if the trend continues, which looks likely, it will lead America to a massive red wave in November. A red wave that looks to continue into 2020, where President Trump will likely be re-elected with a margin that would send the Progressive’s into a state of panic. A red wave that would make 2016 look like small potatoes. Next Next post: Finally, A President Who Won’t Let The World Use America And American’s As The World’s Piggy Bank!